Vera Farmiga loves starring in 'Up In The Air' with George Clooney because her character got to ''turn the tables'' on ''disgustingly'' charming George Clooney. James Cameron's "Avatar" continues to race up the box office charts, remaining No. 1. Rihanna has lashed out at vicious internet gossip which suggested ex-boyfriend Chris Brown beat her after she contracted a cold sore on her lip - angrily insisting the blemish is a scar. Jake Gyllenhaal is used to Hollywood rivalry because there has always been an edge of competitiveness between him and actress sister Maggie Gyllenhaal. NBC said Sunday it decided to pull the plug on the Jay Leno experiment when some affiliate stations considered dropping the nightly prime-time show. Former "Friends" star Matt LeBlanc is returning to U.S. television for the first time since 2006, playing himself in a quirky comic spoof of the TV business. 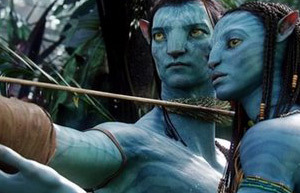 "Avatar" ruled the worldwide box office for a fourth weekend on Sunday, creeping closer to the all-time record held by writer/director James Cameron's earlier effort "Titanic. Hollywood no longer an "original idea town"
The idea for Tracy Chevalier's latest novel "Remarkable Creatures" came to her in a dinosaur museum in Dorset, England. U.S. artist Emily Prince has been working on "American Servicemen and Women Who Have Died in Iraq and Afghanistan" for five years, and is likely to have to do so for several more. A Minute With: Daniel Day Lewis on "Nine"
Hugh Jackman at the 2010 People's Choice Awards in L.A.